When shipping metal parts in cardboard corrugated boxes, do you allow the unprotected parts to touch the box? If so, then the corrugated may be the source of the corrosion. When cardboard boxes are manufactured, the paper begins as a pulp and is then dissolved using nitric acid. In order to neutralize the acid before forming the pulp into paper, the manufactures sends the pulp through a series of rinsing stages. Even after the rinsing process, it is common for the acidic residue to be left on the cardboard. Since corrugated cardboard tends to absorb water/moisture, this activates the acidic residue which will cause corrosion on metals that are placed directly on or near the corrugate. To avoid this, it is important that the metal parts are separated from the corrugated with packaging. 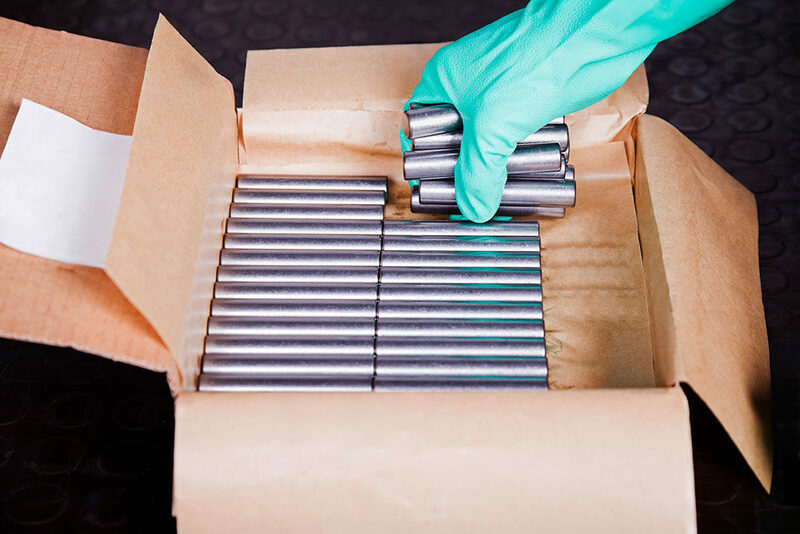 A common method to protect metal parts from corrosion causing contaminants is using Volatile Corrosion Inhibitor (VCI) packaging to separate metals from the cardboard. VCI Kraft paper or VCI poly sheeting and bags come in many convenient sizes for this purpose. VCI Kraft Paper comes on rolls or in cut sheets and can be interleaved in layers between cardboard and the part. It also can wrap parts which stabilizes them in shipping and warehouse operations, protecting the parts from scratches. VCI poly sheeting can be used for interleaving and VCI poly gusset bags can line boxes or smaller bags individually package parts. Zerust paper and poly products protect your metal parts from corrosion as they release a corrosion inhibiting vapor that diffuses throughout the box, and settles on exposed metal surfaces to form a microscopic corrosion inhibiting layer. This protective layer will remain on the surface of the metal during the shipment until the part is removed from the enclosure, leaving the metal part clean, dry and corrosion-free.